"For a quick chili fix, perfect on a cold night." Heat turkey chili in a saucepan over medium-high heat until hot, 6 to 7 minutes. Place corn chips in a large bowl and spread the turkey chili on top. 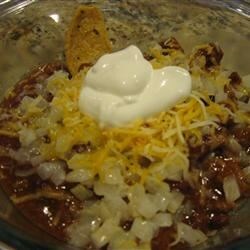 Sprinkle Cheddar cheese and onion over the chili, and top with a dollop of sour cream. A good ol' texas fav!